Nice to give as a small birth present. Steiff EAN 237850 Mockily Hippo grip toy with rattle. 12 cm. Mockily Hippo Grip toy with rattle . She is made of soft blue and pink plush. She has safety eyes and is filled with synthetic stuffing material. With CE mark for safe toys and machine washable at 30 degrees C.
Steiff EAN 237157 Sleep well teddy grip toy pink, 12cm. Sleep well teddy rattler. 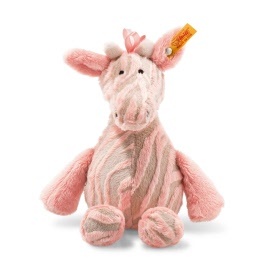 She is made of soft pink and brown plush. She has embroidered eyes and is filled with synthetic stuffing material. 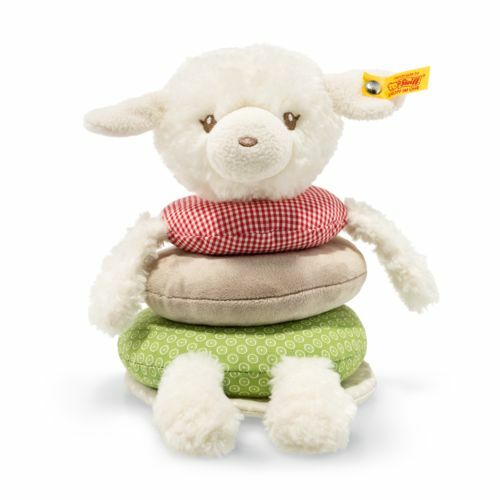 With CE mark for safe toys and machine washable at 30 degrees C.
Steiff EAN 237928 Lenny Lamb grip toy, 15cm. 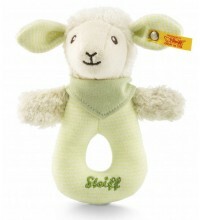 Steiff Lenny Lamb grip toy is 15 cm. / 6" tall and made out of super soft fluffy white organic cotton and green baby soft material. She rattles when you shake her. 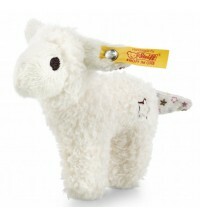 This Steiff animal is machine washable at 30° C and has the CE mark for safe toys. 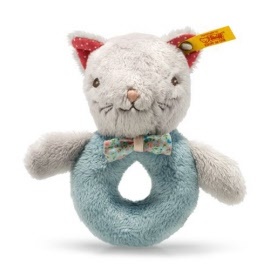 This Steiff baby toy has a stainless steel button in her left ear. 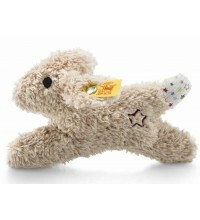 Steiff EAN 240683 Mini rabbit grip toy, 11cm. This Steiff animal is 11 cm. / 4.4" tall and made out of beige baby-soft skin plush. He rattles when you shake him and has rustling foil inside his body. This Steiff baby toy has a stainless steel button in his left ear. 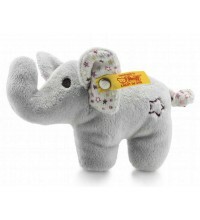 Steiff EAN 240690 Mini elephant grip toy, 11 cm. This Steiff animal is 11 cm. / 4.4" tall and made out of grey baby-soft skin plush. Steiff EAN 240676 Mini lamb grip toy, 11cm. This Steiff animal is 11 cm. / 4.4" tall and made out of white baby-soft skin plush. 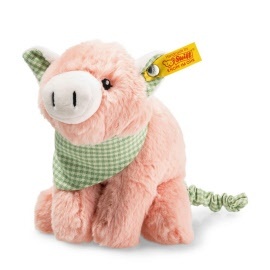 Steiff EAN 240652 Mini pig grip toy, 11cm. This Steiff animal is 11 cm. / 4.4" tall and made out of pink baby-soft skin plush. Steiff EAN 241185 Teddy Band Nickly rattle set 15cm. Teddy bear band Niklie Teddy Bear rattle set. Niklie is made of beige and blue plush for baby-soft skin. He has embroidered eyes and is stuffed with synthetic filling material. He is machine washable at 30° C and has the CE mark for safe toys. He has a stainless steel “Button in Ear”. 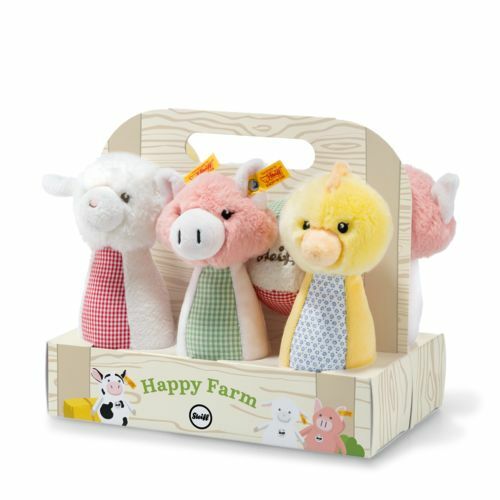 Steiff EAN 240973 Happy Farm Mini Band , 10cm. 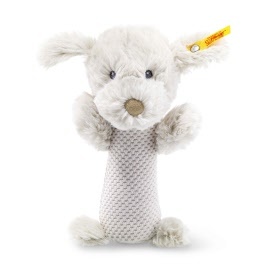 The mini band set is made of multicoloured plush for baby-soft skin. It has embroidered eyes and is stuffed with synthetic filling material. It is machine washable at 30° C and has the CE mark for safe toys. It has a stainless steel “Button in Ear”. Each animal contains a rattle. Steiff EAN 240867 Happy Farm Skittles set, 20cm. The Skittles set is made of multicoloured plush for baby-soft skin. It has embroidered eyes and is stuffed with synthetic filling material. It is machine washable at 30° C and has the CE mark for safe toys. It has a stainless steel “Button in Ear”. Each animal is 2x in the set. 3 different animals. 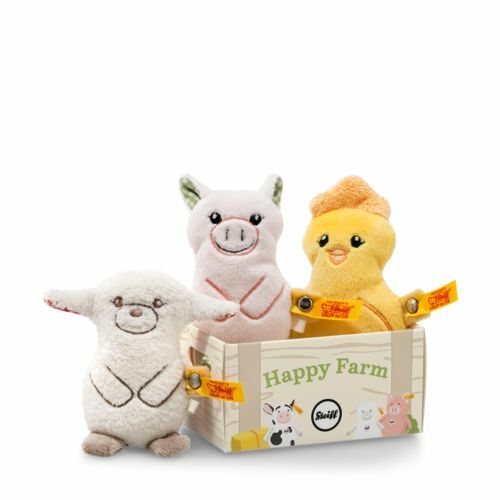 Steiff EAN 240850 Happy Farm Lambaloo stacking rings, 18cm. 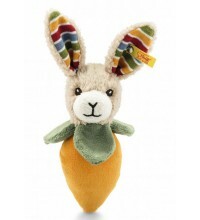 Lambaloo is made of cream/multicoloured plush for baby-soft skin. She has embroidered eyes and is stuffed with synthetic filling material. She is machine washable at 30° C and has the CE mark for safe toys. She has a stainless steel “Button in Ear”. Steiff EAN 240966 Happy Farm Piggilee musical toy, 19cm. Children can throw Piggilee around as much as they want. The 19 cm piglet with chime stands up by itself and still plays its happy tune. 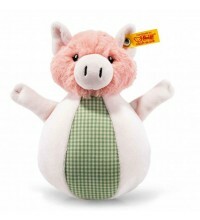 Piggilee comes in natural pink and wears a little green pinafore. Then after playtime comes cuddle-time. It is made out of pink/green and white plush for baby-soft skin and stuffed with synthetic filling material. The baby collection has embroidered eyes and nose his surface is washable. It is with CE mark and stainless steel "Button in Ear"
The Cat is made of grey and petrol plush for baby-soft skin. He has embroidered eyes and is stuffed with synthetic filling material. He is machine washable at 30° C and has the CE mark for safe toys. He has a stainless steel “Button in Ear”. Steiff EAN 241130 Blossom Babies rabbit musical toy, 20cm. 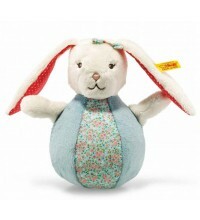 A great rabbit from Blossom Babies – he rights himself up whenever he's knocked over and jingles happily all the time. This encourages baby to play and develops baby's hearing at the same time. 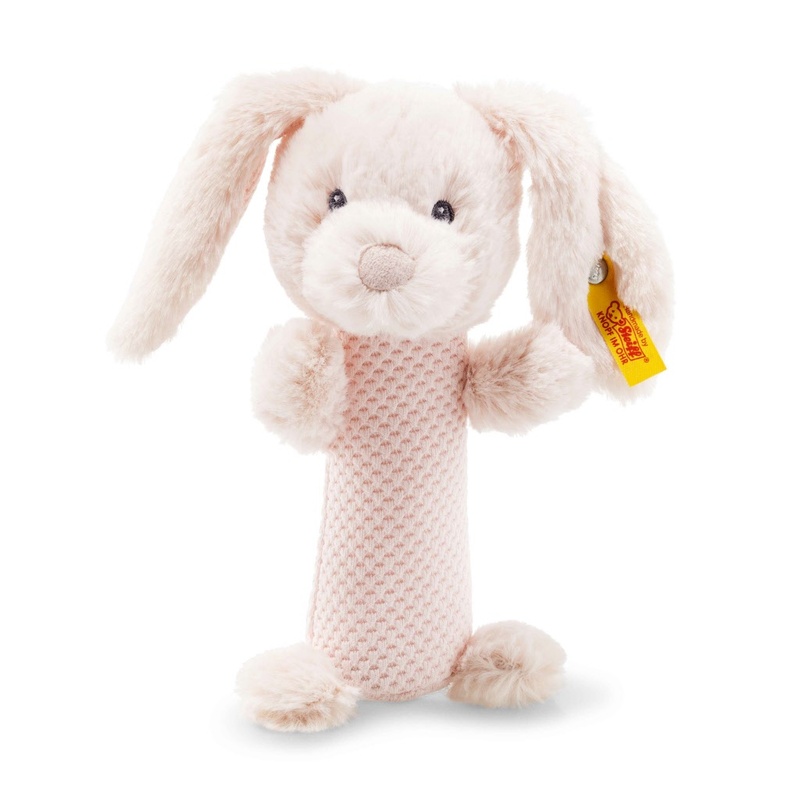 Baby can pull all they want on the long ears and paws; this rabbit is an all-round toy which children will have fun with for a long time. A cuddly soft multicoloured companion in all situations in life. Size: 19 cm. It is made out of multicoloured plush for baby-soft skin and stuffed with synthetic filling material. 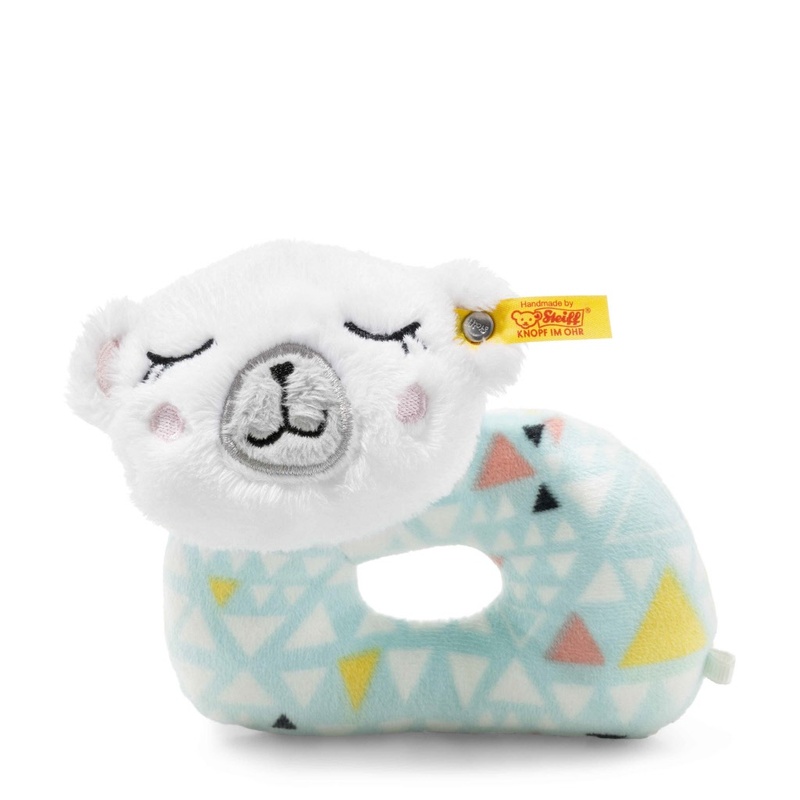 The baby collection has embroidered eyes and nose and is machine washable at 30° C. It is with CE mark and stainless steel "Button in Ear"
Steiff EAN 241314 Iggy polar bear grip toy Soft Cuddly Friends, 12cm. 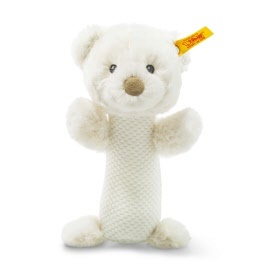 Iggi Polar bear grip toy gives warmth, comfort and fun. It's a wonderful present for a newly born and on many other occasions. 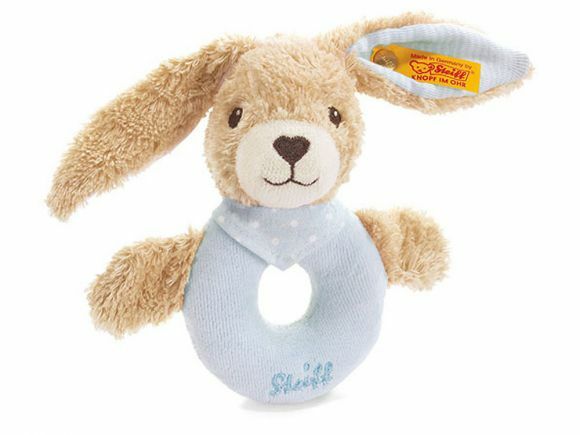 Steiff EAN 240805 rattle Belly rabbit Soft Cuddly Friends, 15cm. Belly rabbit rattle gives comfort and fun. The 15cm tall rabbit rattle has two funny pink ears which provide comfort and softness. It's a wonderful present for a newly born and on many other occasions. It is made out of pink plush for baby-soft skin and stuffed with synthetic filling material. The baby collection has embroidered eyes and nose and is machine washable at 30° C. It is with CE mark and stainless steel "Button in Ear"
Steiff EAN 240782 rattle Giggles Teddy bear Soft Cuddly Friends, 15cm. Giggles Teddy Bear rattle gives comfort and fun. It's a wonderful present for a newly born and on many other occasions. It is made out of cream plush for baby-soft skin and stuffed with synthetic filling material. 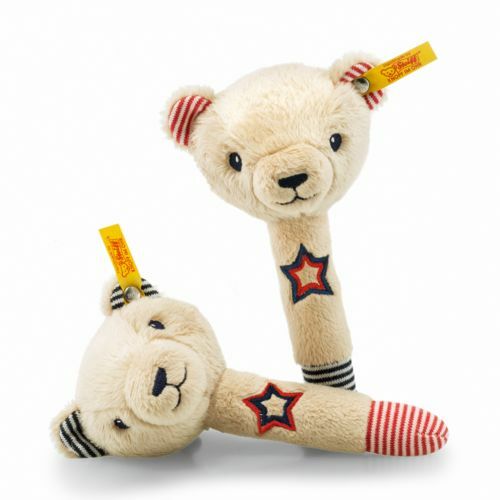 The baby collection has embroidered eyes and nose and is machine washable at 30° C. It is with CE mark and stainless steel "Button in Ear"
Steiff EAN 240799 rattle Baster dog Soft Cuddly Friends, 15cm. Baster Dog rattle gives comfort and fun. It's a wonderful present for a newly born and on many other occasions. It is made out of light grey plush for baby-soft skin and stuffed with synthetic filling material. 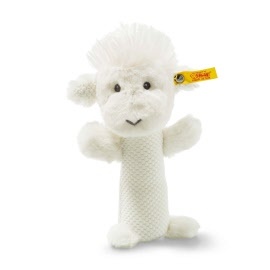 The baby collection has embroidered eyes and nose and is machine washable at 30° C. It is with CE mark and stainless steel "Button in Ear"
Steiff EAN 240775 rattle Wooly Lamb Soft Cuddly Friends, 15cm. Wooly Lamb rattle gives comfort and fun. It's a wonderful present for a newly born and on many other occasions. 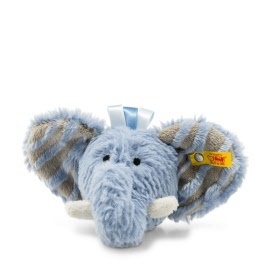 Ellie Elephant rattle gives comfort and fun. It's a wonderful present for a newly born and on many other occasions. 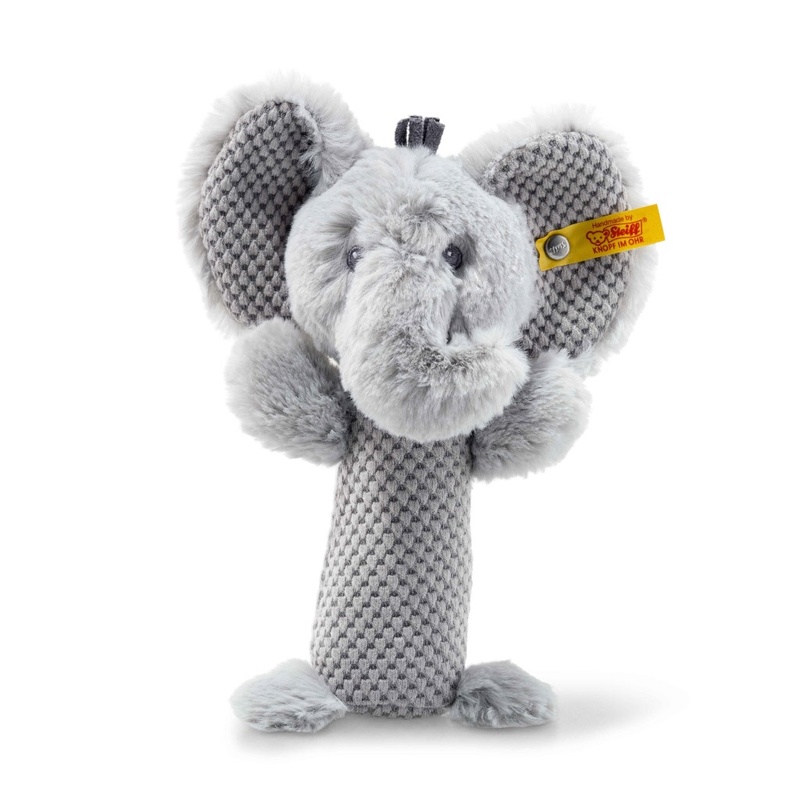 It is made out of grey plush for baby-soft skin and stuffed with synthetic filling material. The baby collection has embroidered eyes and nose and is machine washable at 30° C. It is with CE mark and stainless steel "Button in Ear"
Giselle Bell Giraffe gives warmth and comfort. She has ringlets attractive to babies and is soft and warm which provide comfort and softness. She makes a bell sound when moving. It's a wonderful present for a newly born and on many other occasions. It is made out of pink plush for baby-soft skin and stuffed with synthetic filling material. 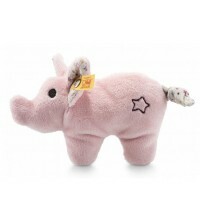 She has embroidered eyes and is machine washable at 30° C. It is with CE mark and stainless steel "Button in Ear"
Steiff EAN 241192 Happy Farm Piggilee pull tail pig, 18cm. Steiff Happy Farm Piggilee pull-tail pig is made out of pink plush. She is machine washable at 30° C. If you pull her tail, she will move. Piggilee has the CE mark for safe toys. Steiff Piggilee has a stainless steel button in her left ear.